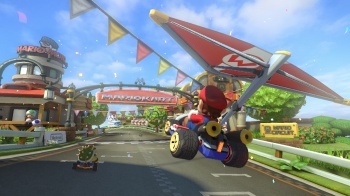 Satoru Iwata finally gave a solid release date to the latest installment in the Mario Kart franchise. Nintendo President Satoru Iwata's big "Corporate Management Policy Briefing" had a lot of talk on puzzling new healthy platforms, and fixes to longstanding Nintendo problems, but as it was more a business thing than a customer thing, news about actual games was pretty thin. We were able to discern one piece of actual, Nintendo videogame related news from his presentation, and that was the confirmation of Mario Kart 8's release date. "We will announce the specific release dates of each software title and the release of new titles in other opportunities such as Nintendo Direct, but today we would like to announce that a key title for Wii U this year, Mario Kart 8, is scheduled to be released globally in May," announced Iwata. He added that Nintendo hopes to create "huge momentum" with Mario Kart 8, to ensure that the release of major Wii U is not a one-off event, but something that will continue to happen regularly throughout the year. A supplemental document released alongside the briefing shows the release schedule for more upcoming Nintendo games, but as far as I can tell, it's nothing we don't already know.